This week finds me looking forward to spring and all things not frost covered, or dishes heavy with root vegetables. Nothing is lighter or tastes like spring like fresh parsley, tomatoes, and hummus. This meal is very light, tasty, and incredibly satisfying, the perfect to brown bag lunch. 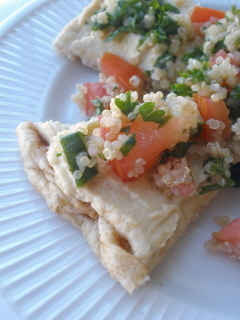 Spread hummus to taste on pita, cover with tabbouleh, and cut into wedges if desired. This wouldn't be half bad with a sprinkle of feta either. All of this can be yours in less than an hour. Hope that there are leftovers. Process all of the ingredients in a food processor until smooth, about 40 seconds. Transfer the hummus to a serving bowl, cover with plastic wrap, and chill until the flavors meld, at least 30 minutes; serve cold. (The hummus can be refrigerated for up to 2 days - but it will never last that long.